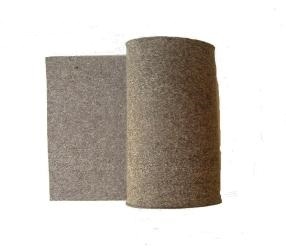 1/4" THICK GREY FELT material for wide variety of usages. Made from 100% wool in Hard density (0.36 gm/c3 - F-3). Density is calculated as grams per sq. cm. Slight color tone may occur from bolt to bolt. But color has no bearing, whatsoever, on any application. Felt is a versatile material so if you can imagine it, use it. Felt is also forgiving so if you need washers, gaskets, seals, o-rings for old tractors, lawn mowers, etc., draw a template on a card stock and cut out the felt with a sharp utility knife. Fisherman, Duck Hunters: 1/4" thick hard density (F-3) can be attached to the bottom of your waders for additional traction in the water. Your local Cobbler can cut the felt and attach it with cobbler's glue. Make sure waders are left hanging to dry after your fishing/hunting trip so the felt can dry up properly to prevent molds. Before using felt bottom waders, please check with your local Fish and Game Commission if a ban is in place to prevent spread of invasive aquatic species. Due to another drastic postage increase starting January 17, 2016, we are forced to increase our prices. This felt is heavy and all sizes have to ship by Priority mail/UPS. We have also been advised by factory of a worldwide shortage of raw wool. Thank you for your understanding. Grey Hard density F-3 = Off-White Hard density F-1. Color has no bearing, whatsoever, on any application.